Jake’s Cab bed sheets are custom made for the trucking industry. The sheet sets are made from soft-touch brushed micro-fiber for that soft cashmere touch. 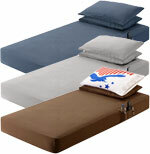 Each set includes, 1 fitted sheet with side pockets for convenience storage, 1 top sheet and 2 20" x 30" pillow cases. 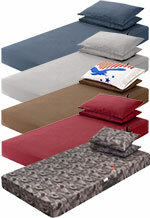 Get homelike experience every night with quality bedding accessories at RoadTrucker. Please Note: There are No Returns on Jake's Cab Solutions' Sheets or Mattress Covers, so please make sure you check the size carefully before purchasing. 28.5" x 78" x 8.2"
Sheet Size: 28.5" x 78" x 8.2"
Pillow Case Size: 20" x 30"
Sheet Size: 30" x 80" x 5"
Blue and Gray Bed Sheets Features polyester microfiber, wrinkle resistant and elasticity to fit/stretch over 7" deep mattresses. 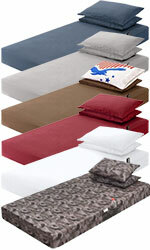 Sheet Size: 32" x 80" x 7.5"
34" x 80" x 7.5"
Easy to care bed sheet with polyster microfiber that offers strength and softness. 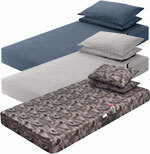 Sheet Size: 34" x 80" x 7.5"
Have a nice sleep with this soft & comfortable Bed Sheet for Volvo/Mack. Sheet Size: 35" x 79" x 7.5"
Bed Sheet Sets Made for Volvo. It’s Soft, Comfortable and Durable. Sheet Size: 36" x 75" x 7.5"
36" x 85" x 7.5"
Sheet Size: 36" x 85" x 7.5"
Pillow Size: 20" x 30"
Sheet Size: 39" x 80" x 7.5"
Comfortable and easy to care bed sheet set with conviniet storage pockets. 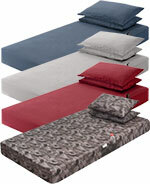 Size: 39" x 80" x 10"
Machine Washable Bed Sheet Set. Soft and Durable Made for Peterbilt, Kenworth, International. 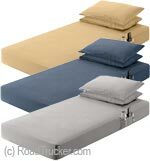 Sheet Size: 42" x 80" x 7.5"
Comfortable and Durable Sheet Set. 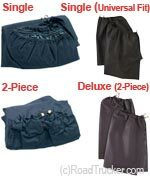 The Sheet has Side-Pockets for Convenience Storage. Sheet Size: 42" x 85" x 7.5"
Wrinkle resistant bed sheet set. It’s soft and easy to wash. Size: 42" x 80" x 10"
Feel the softness of this 54" Mattress Bed Sheet set. Made to fit on any 54" wide truck bunk. 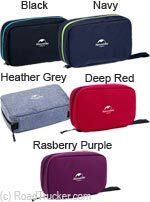 Size: 54" x 80" x 7.5"
Waterproof coating keeps your item dry inside this traveling toiletry bags. Durable and very convenient multi bag design. 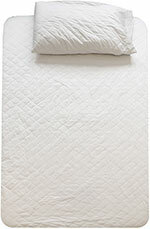 Enhance and add 1/2 inch thickness to your mattress with Quilted Mattress Protector by Jake's Cab. White color pillow cases that match any color of your bed sheets. It’s soft and comfortable. Privacy Curtains has a material to block out sun & glare and protect your privacy. This innerspring mattress is made w/a heat tempered Bonnell innerspring built to resist a strong cab environment.